McALLEN — Educators and local professionals stressed the importance for parents to be aware of cyberspace dangers and to communicate with their children to protect them against those dangers. 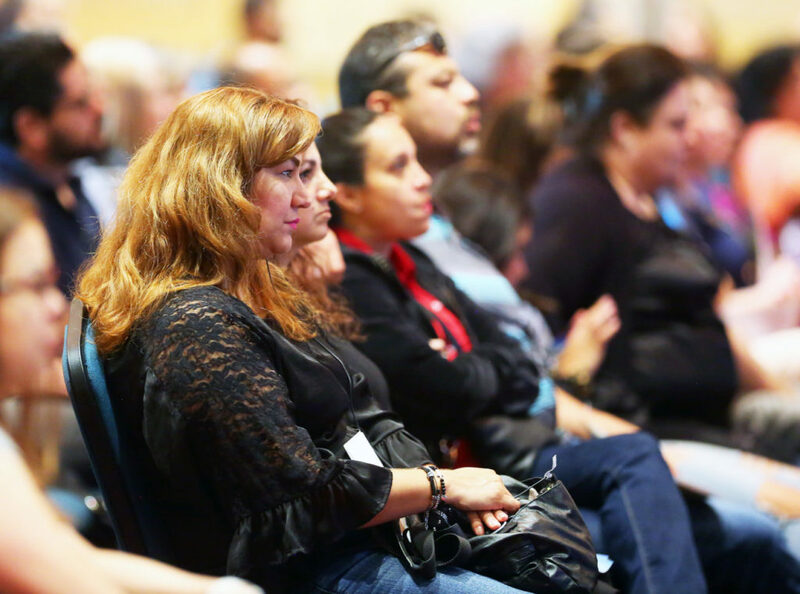 Cyberbullying, privacy breaches leading to safety problems and the consequences of choices made online were some of the major topics discussed with a crowd of over a 100 parents and students in the McAllen Convention Center Thursday evening. Futuro RGV along with CodeRGV, McAllen Police Department and McAllen Independent School District were among the entities present for “Parenting Your Cyber Teen.” Awareness, taking preventative measures and making impactful actions were all a part of the goals emphasized during the evening. The digital age and its impact on everyday life were important issues of the evening. 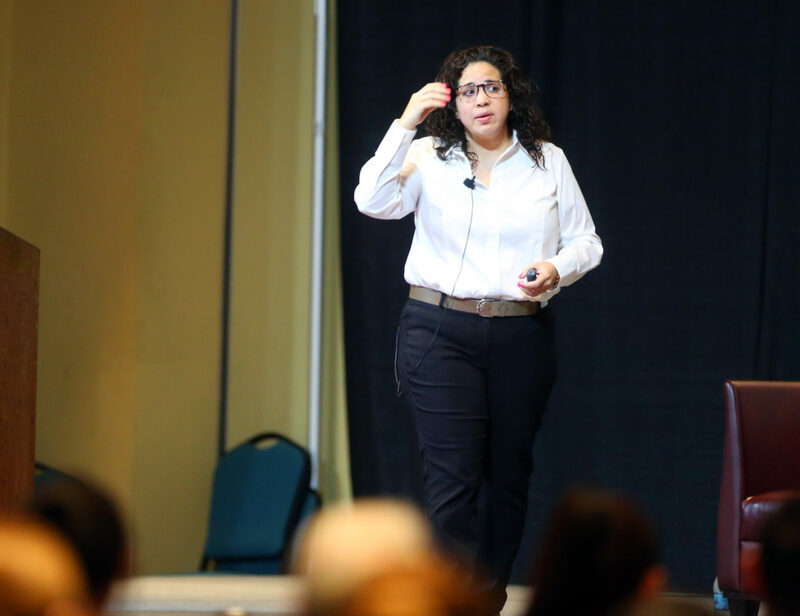 “The kids aren’t different but the world is different that we live in,” child psychiatrist Delisa Guadarrama said during a presentation. There is a need to adapt to ensure teenagers and young children are safe as technology changes, she added. The majority of teenagers have access to a cellphone, with over 90 percent of teenagers having some social media presence, she said. Risks such as cyberbullying, harassing or exposing someone through online means, can lead to deteriorating mental health or suicidal ideation. Predators and exposure to illegal or inappropriate content are other issues students and their parents face. Speakers complemented their presentations through video clips such as showing the consequences of sharing inappropriate content on social media, a student’s daily social media routine and testimony of a victim. Empathy and lending an ear to a child’s concerns became a common theme for presenters. McAllen Youth Crime investigator Melissa Saenz has served as officer for 11 years and handles cases of youth aged 10-17, she said. Although children may find or send inappropriate content online, parents should take time to listen to them to understand their perspective and how they feel. “Listen to what they have to say, they live very different lives than (from) when we grew up,” Saenz said. Oftentimes, students may receive unsolicited images and should not be blamed for it. Besides listening, reporting the inappropriate content is also a step trusted adults and parents should take, she said. UTRGV advertising professor Kimberly Selber and talk show host Davis Rankin moderated the event. Selber and Rankin facilitated transitions between presentations and a panel between counselors and a health service professional across the McAllen, Weslaco and Pharr-San Juan-Alamo school districts. Healthy sexuality, addiction and body image are all important issues parents should discuss with their children to check on their well-being, Guadarrama said. “Talk to your teens, that’s probably the biggest tip we can give you tonight,” Guadarrama said. Parents asking about the “peak” and “pit” of their day are good ways to start a conversation with children, she added. “But almost always the peak is something that you might not have known, that was really interesting to know about your kid, just that day, and that conversation takes less than a minute,” she said.